One important weather phenomenon in gliding is clouds. They play a vital role in how good a particular day will be. On a good day high and medium clouds are absent, and cumulus clouds mark the tops of the thermals. This section looks at these clouds, classifies and describes them according to the international cloud atlas. As a general rule, the medium and high level clouds tend to be bad news for gliding. Of the low level clouds, the Cumulus cloud is the 'good guy'. Cirrocumulus (Cc): Normally the highest observed cloud, with the appearance of grains or ripples, merged or separate, and more or less regularly arranged. They often look like the scales of a fish, hence the term 'Mackeral Sky'. The majority of the elements have a width of less than one degree. 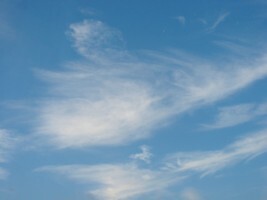 Cirrus (Ci): Detached clouds in the form of white feathery filaments or mostly white patches or narrow bands. These clouds have a fibre 'hair' like appearance or a silky sheen or both. They are made primarily of ice and are easily stretched by the high winds of the upper troposphere. This cloud doesn't usually have a significant effect on gliding conditions in the low layer. Cirrostratus (Cs): Transparent or whitish veil of cloud, fibrous (hair- like) or smooth in appearance, totally or partly covering the sky. Can produce halo phenonema, allowing the sun or moon to show clearly through it. This particular cloud often precedes a warm front, and reduces the amount of sun's energy getting through. Weakens or kills thermals. Of the high clouds this is the worst cloud for gliding. Altocumulus (Ac): Generally appear white or grey or a mixture of both. Normally in the shape of a patch, sheet or layer of cloud, and look like a rounded mass or rolls. Sometimes fibrous or diffuse and may be merged or not. Similar in appearance to Stratocumulus (low cloud), however, can be distinguished by pointing your hand towards the cloud; if the cloud is about the size of your thumbnail, then it is altocumulus. A reasonably valid rule is: "altocumulus clouds in view on a warm humid morning indicate thunderstorms by afternoon". 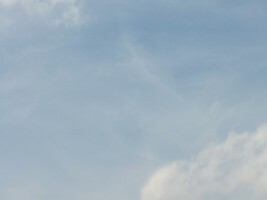 This cloud often forms in a moist layer of air at medium altitude, and can prevent enough of the sun's energy from getting through to power the thermals. 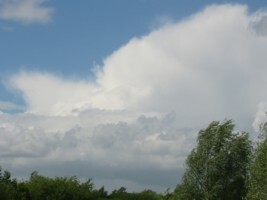 This cloud can also result from spreadout, when rising cumulus clouds hit a moist layer. Spreadout is bad news for gliding - too much moisture in the air. 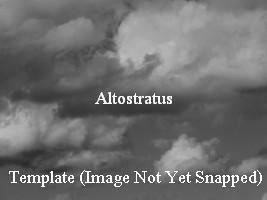 Altostratus (As): Grey often with a bluish tinge, layer or sheet of cloud, normally fibrous or uniform in appearance, totally or partly covering the sky. Usually thin enough to show the sun or moon opaquely as if looking through ground glass or appearing with a watery sheen. 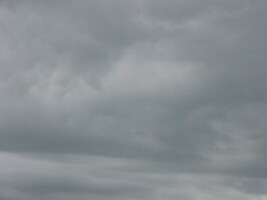 Altostratus cloud usually forms ahead of storms with continuous rain or snow. Occasionally rain falling from Altostratus can actually reach the ground, when this occurs it is re-classified as Nimbostratus. It is flyable with altostratus around, but not usually soarable. Essentially a lower, thicker version of cirrostratus. Nimbostratus (Ns): Dark grey in appearance and often diffuse due to more or less continuously falling snow or rain. Normally thick enough to block out the sun or moon, and may have low clouds beneath it which may or not merge. This usually means no gliding at all because of poor conditions and visibility. Cumulus (Cu): These generally appear white or grey or a mixture of both. Normally in the shape of a patch, sheet or layer of cloud, and look like a rounded mass or rolls. Sometimes fibrous or diffuse and may be merged or not. On a good soarable day a solid looking cumulus cloud with a darkish flat base marks the top of a thermal. They also often form a line in the direction of the wind, called 'cloud streets'. The more scraggy / fibrous clouds with less well defined bases are usually cumulus clouds on top of a decaying, dying thermal. If a cumulus grows rapidly and to great height, it can become a cumulonimbus (Cb) cloud. New active thunderstorms are indicated by cumulus growing rapidly into cumulonimbus on a humid day, even though the Sun may be shining brightly between the clouds. The presence of cloudiness marks smaller diurnal temperature variations. 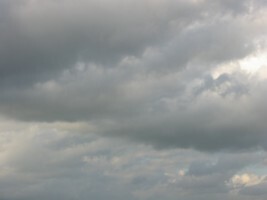 In the evening a low overcast sky acts like a blanket, preventing the temperature from dropping much at night. A clear evening sky, on the other hand, indicates rapid cooling, which leads to dew, frost, or fog the following morning. Cumulonimbus (Cb): Cumulus clouds can be associated with good or bad weather. During "pleasant" days they can look like puffy white or grey cotton wool balls. They are generally dense, detached clouds with sharp outlines and normally with a flat base at around 1000ft or higher around the British Isles. Cumulus clouds develop vertically in the form of rising mounds, domes or towers, sometimes resembling a cauliflower and vertical growth can lead to Towering Cumulus (TCu) or when the atmosphere is very unstable develop into Cumulonimbus (Cb), - The most dangerous cloud in the Genera. Cumulonimbus clouds present the most danger to aviation, and are associated with thunderstorms and tornadoes. Heavy and dense with a tremendous vertical extent which can reach up to 10km in height in some latitudes, and resemble mountains or large towers. In the upper reaches high winds tend to flatten the top and smooth it into an anvil shape. The base is normally very dark, and low ragged clouds may or may not merge into the Cb. While light and moderate showers are safe and sometimes great fun to soar around, Cb's should be avoided at all costs. Lightning can present a danger, as well as heavy rain and perhaps hail too. Cb's are also bad in that they kill all the thermals for miles around them. If you are cross country and a Cb lies between you and home, there is a fair chance you could have to land out, although this isn't always the case. 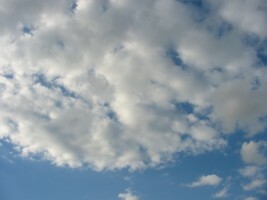 Stratus (St): A low layer of cloud. When this layer forms at ground level it is known as mist or fog. Stratus can prevent gliding from ocurring at all, simply because you can't see where you are flying. Stratocumulus (Sc): This cloud forms when cumulus clouds join together to form a layer of cloud at the same height as cumulus. 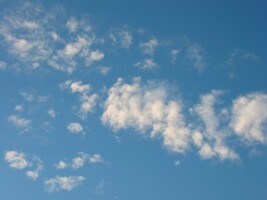 This cloud can form as a result of spreadout, when cumulus clouds spread out and fill the gaps between them. This can happen if the air is unstable but too moist. When this happens thermals tend to die. Thanks to Weather Action email newsletters (April - July 2000) from where much of the above information was obtained.